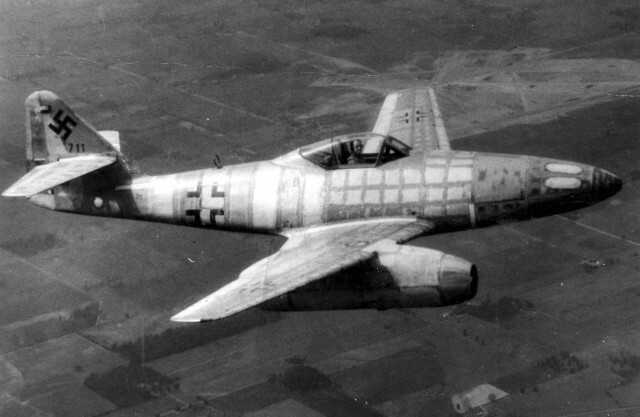 Messerschmitt Me 262 Schwable, the world’s first jet fighter. The Messerschmitt Me-262 was the world’s first operational jet-powered fighter aircraft, and also the world’s first mass-produced jet fighter. The first successful flight of a jet Me-262 occurred on the 18th of July, 1942. Design work had started before World War II began, but engine problems, metallurgical problems and top-level interference kept the aircraft from operational status with the Luftwaffe until mid-1944. The Me-262 was faster and more heavily-armed than any Allied fighter, including the British jet-powered Gloster Meteor. Pilots of this aircraft claimed a total of 542 allied kills, though claims for the number are often higher than what was actually shot down. Captured Me 262s were studied, and flight tested by the major powers and influenced the designs of many post-war aircraft such as the North American F-86 Sabre and Boeing B-47 Stratojet. The U.S. also captured the Arado Ar 234 jet-powered bomber, which technology would go on to be found in the U.S. Army Air Force’s B-45s and B-47s. As early as 1939, the first night vision devices were introduced by the German army. The first devices were being developed by AEG starting in 1935. By the end of World War II, the German army had equipped approximately 50 Mark V Panther tanks, which saw combat on both the Eastern and Western Fronts. 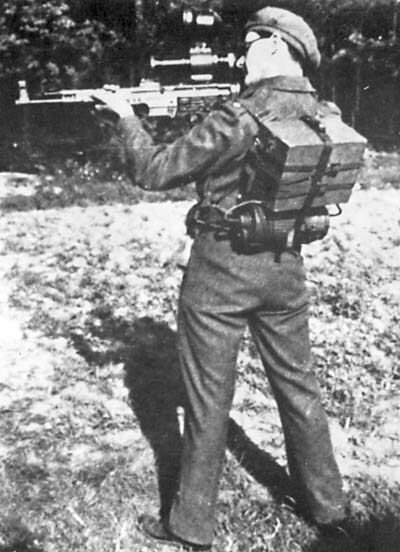 The “Vampir” man-portable system for infantrymen was being used with STG-44 Sturmgewehr assault rifles. The ZG 1229 Vampir weighed about 5 lbs and was fitted with lugs at the weapons production facility. The soldier carrying this was known as night-hunter. As well as the sight and infrared spotlight, there was a wooden cased battery for the light, and a second battery fitted inside a gas mask container to power the image converter. This was all strapped to a Tragegestell 39. The searchlight consisted of a conventional tungsten light source shining through a filter permitting only infrared light. The sensor was not sensitive to body heat because it operated in the upper infrared (light) spectrum rather than in the lower infrared (heat) spectrum. The Vampir gear was used for the first time in combat in February 1945. 310 units had been delivered to the Wehrmacht in the final stages of the war. Eastern Front veteran reports consist of snipers shooting at night with the aid of ‘peculiar non-shining torches coupled with enormous optical sights’ mounted on their rifles. Similar infrared gear was fitted both to MG34 and MG42 machine guns.